The Convention on Biological Diversity, signed in 1992, represents a dramatic step forward in the conservation of biological diversity, the sustainable use of its components and the fair and equitable sharing of benefits arising from the use of genetic resources. Furthermore, for the first time the international community has taken a comprehensive rather than a sectoral approach to conservation. The Convention recognizes that biodiversity and biological resources should be conserved for reasons of ethics, economic benefit and human survival. The Convention goes beyond the conservation of biodiversity and the sustainable use of biological resources, to encompass such issues as access to genetic resources and biotechnology. In addition, it recognizes the uneven distribution of biodiversity around the globe. If biodiversity is to be conserved, it imposes a heavier burden on the south. To carry such a burden, developing countries need additional contributions from, and increased partnerships with the industrial countries. The Convention requires parties to integrate biodiversity conservation into national decision making, for example, national biodiversity strategies. It also requires parties to promote the sharing of information, to adopt incentive measures, to undertake research and training to encourage public education and to carry out environmental impact assessments on projects likely to have significant adverse effects on biological diversity. Turkey has been a Party to the Convention on Biological Diversity since 1996. Currently, there are 190 Parties to the Convention. Turkey has submitted its third National Report in February 2007 to the Secretariat of the Convention. The studies have been continuing with the coordination of the Ministry of Environment and Forestry for the revision of the “National Biological Diversity Strategy and Action Plan” that was prepared in 2001 in accordance with the Convention with a view to define the required actions to reach the biological diversity targets in Turkey. Since 2004, Turkey has been Party to the Cartagena Protocol on Biosafety to the Convention on Biological Diversity, which was open for signature in 2000, that was prepared to contribute to ensuring an adequate level of protection in the field of the safe transfer, handling and use of living modified organisms resulting from modern biotechnology that may have adverse effects on the conservation and sustainable use of biological diversity. Turkey enjoys several distinct biogeographic regions, each with its own endemic species and natural ecosystems, which are the Caucasian Mountain forests, with the temperate deciduous forest, alpine meadows, Central and Eastern Anatolian steppe grasslands and the Mediterranean region, which includes the world’s largest remaining Cypress forests and Lebanon Cedar forests. In addition, Turkey hosts 75% of the total number of plant species found in Europe. 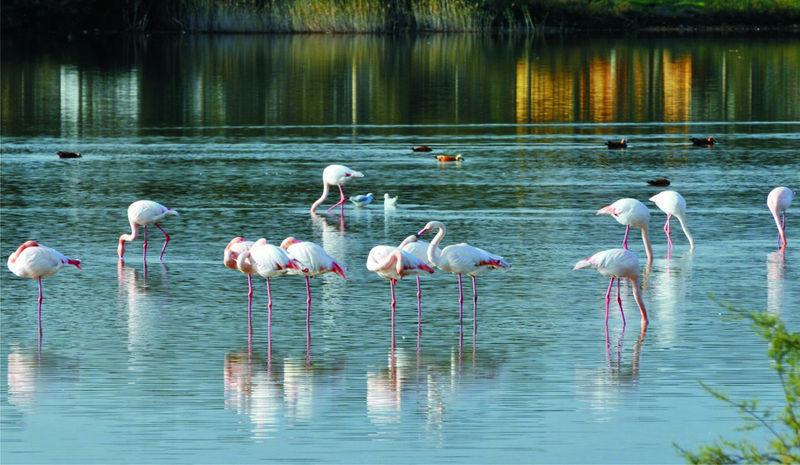 Furthermore, Turkish wetlands are of crucial importance for many breeding species of birds, such as the Dalmatian pelican, which is a globally threatened bird. Moreover, approximately 70% of the world’s population of the White-headed duck, another globally threatened species, spends its winters in Turkish wetlands, especially at the Burdur Lake. Millions of migratory birds move between Western Eurasia and Africa each year. In the fall, flocks of storks and birds of prey can be seen from the hills of Camlica in Istanbul. Coruh Valley, located in the northeast of Turkey, reprensents another major migration route, especially for birds of prey.